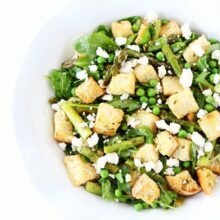 Spring Panzanella Salad-this panzanella salad is bursting with spring vegetables and is a great side dish to any meal. When I eat a salad, I want a salad with substance. I don’t want a wimpy salad with just greens-I like to pack my salads full of goodies! My current favorite salad is this Spring Panzanella Salad. 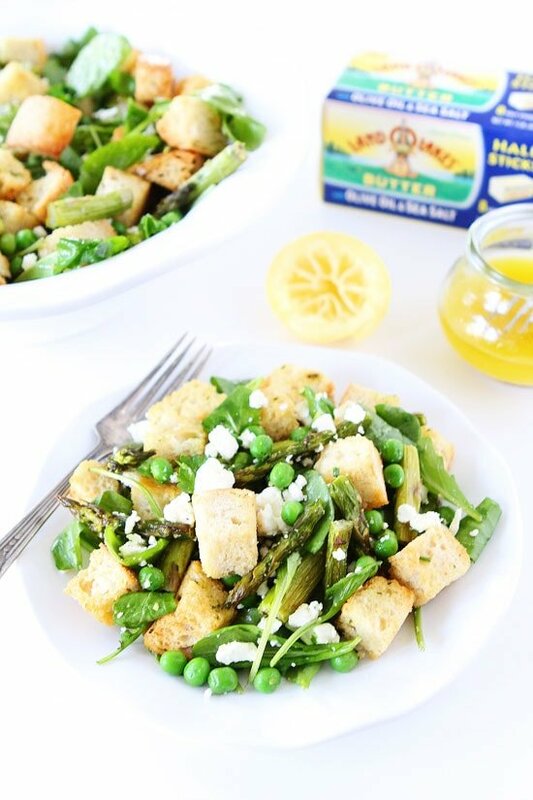 It has lots of spring green veggies and buttery herbed croutons. A salad with carbs? Yes, please! Traditionally, panzanella salad is made with day old bread, but I rarely have day old bread lying around because I can never resist a fresh loaf of bread:) So instead of letting my bread get stale on the counter, I dried it out in the oven. I melted a half stick of Land O Lakes® Butter with Olive Oil & Sea Salt and stirred in freshly chopped chives and parsley. It’s so nice to have the half sticks already wrapped and premeasured so that I don’t have any leftovers to put back in the fridge. I roasted a beautiful bunch of asparagus to go in my panzanella salad. I also added peas, arugula, and feta cheese to the mix. I whisked up a light lemon dressing to give the salad a refreshing finish! The salad was almost too pretty to eat! Almost! 🙂 Just looking at it makes me happy! It screams spring! 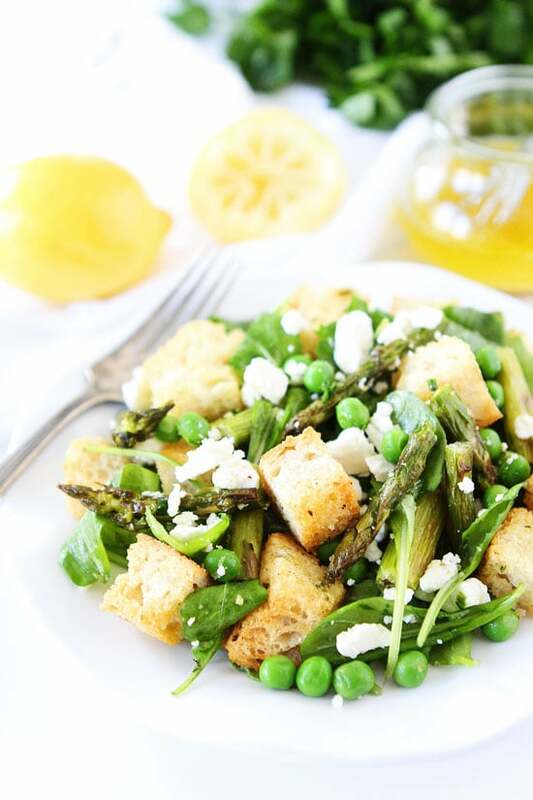 The salad is refreshing and the buttery herbed croutons add a great crunch! If you are looking for a new spring salad to whip up, make this Spring Panzanella Salad. It is great for brunch, lunch, or dinner! It is already on our Easter menu. I can’t wait to make it again! It is my new favorite spring salad! This simple Spring Panzanella Salad is great for brunch, lunch, or dinner! Preheat oven to 400 degrees F. Place bread cubes in a large bowl. In a small bowl, combine melted butter, chives, and parsley. Pour herb butter over the bread cubes and toss until well coated. Pour bread cubes on a large baking sheet. Place asparagus pieces on a separate large baking sheet and drizzle with olive oil. Toss until well coated. Season the bread cubes and asparagus with salt and black pepper, to taste. Place baking sheets in the oven and cook for 30-35 minutes, or until bread cubes are crunchy and slightly golden brown and asparagus is tender, but still crisp. You will want to stir the bread crumbs and asparagus 1-2 times while they are in the oven. Remove pans from oven and cool to room temperature. 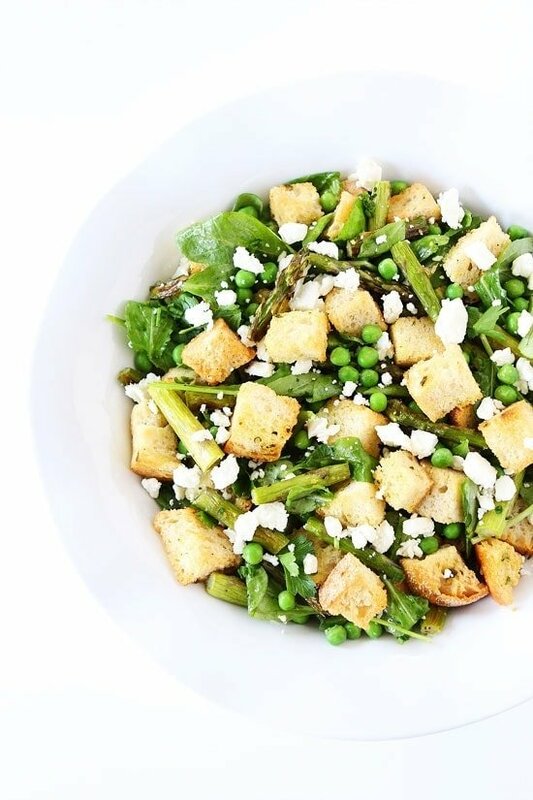 In a large bowl, combine the bread cubes, asparagus, arugula, peas, and feta cheese. To make the dressing, in a small bowl, combined olive oil, lemon juice, balsamic vinegar, honey, shallot, and garlic. Whisk until well combined. Season with salt and black pepper, to taste. Drizzle dressing over the salad and gently toss. Garnish panzanella salad with additional chives and parsley. Serve. Note-this salad is best the day it is made. It can be made a few hours in advance. Now this is one beautiful salad. Love asparagus and peas together. 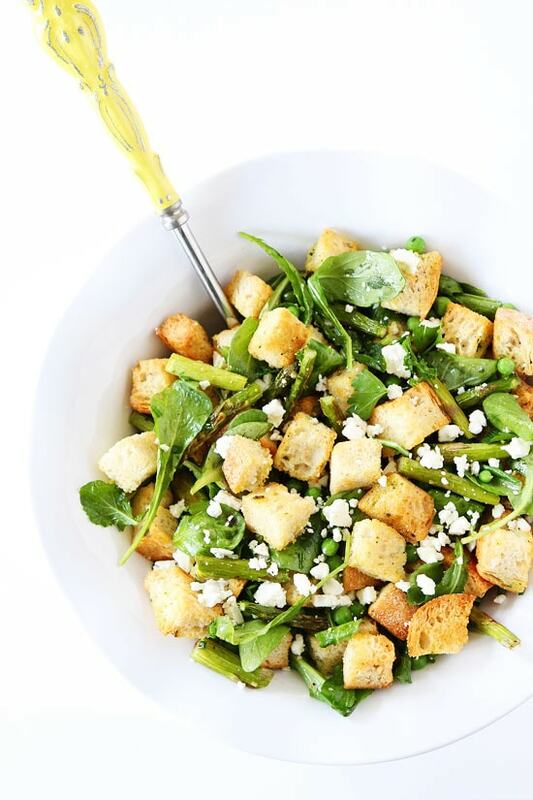 And the artisan bread croutons… Spring is in the air with this salad. Pinned! So glad spring is coming! That looks great. Can’t wait for spring! Pinned. All that green! I can’t wait for Spring!! I love panzanella…can’t wait to try your version. Going shopping today. Thank you also for bringing the pinning and feeding America to my attention. This salad – Yes Please! I’m so excited for all the “Spring” foods that I’m seeing! It makes me feel like I can finally shake off the last of my winter chill. Also, a salad with substance is my favorite kind of salad. 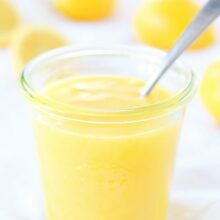 Can’t wait to try this one, great recipe! With spring just around the corner, this salad needs to be actioned!! 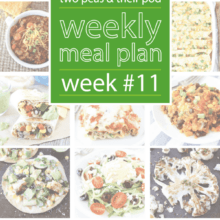 What a delicious salad and a great cause… pinned! 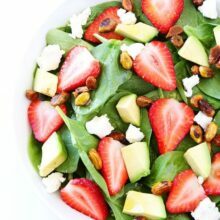 This is such a beautiful spring salad! I also love this program you are supporting-pinning! A great use of fresh spring flavors! I don’t see that many “twists” on panzanella, either; this is a creative idea! Beautiful Salad Maria- so bright and fresh! Yes! The perfect spring salad! This salad is Spring on a plate! Love that you are supporting this great cause! A salad made with bread!?! That is my kind of salad! 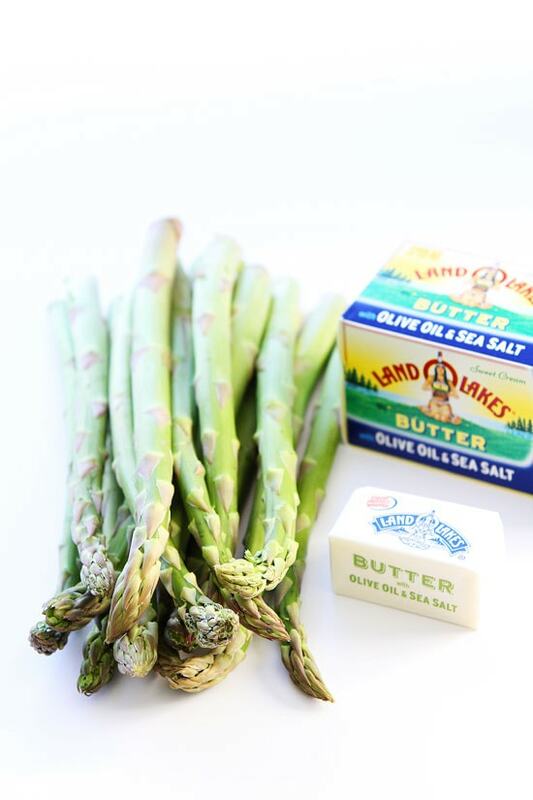 I need to try that Land O Lakes Butter with Olive Oil. I’ll look for it next time I’m shopping! I love spring vegetables..this is so creative, Maria!!! Wow this salad looks so good! I love all the bright green vegetables! 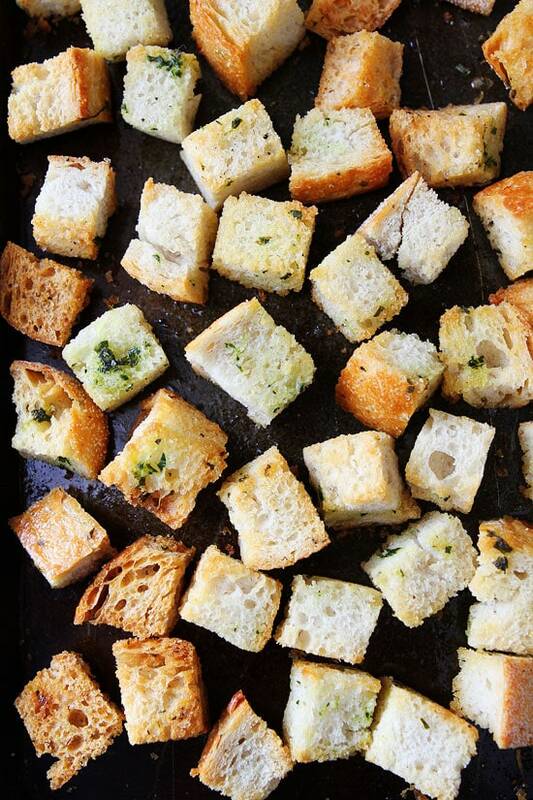 Those homemade croutons….I can never help myself from snacking on them. So ready for spring! I love this panzanella especially with the addition of feta! So pretty and green and filled with spring…love this! It’s gorgeous! You have me craving salad this evening! The salad looks do fresh and spring-like! Looks delicious ~ suggestions for a feta substitute, please? Beautiful spring salad!! Love these flavors! Love this salad. It is delicious! Maria Bruce kriner here. 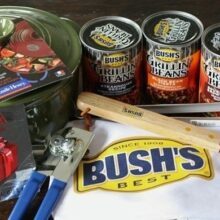 I follow and try many of your receips. Thanks for the great receips you put out. Just received 10 receips from u Friday and with Easter coming up u just helped.